Heather was scheming of ways that we’d be able to hike every single kilometer of Baxter’s trails and Wade wanted to get into the last big area of the park that we hadn’t yet explored. So Baxter North it would be! This would be our 4th trip to Baxter State Park, so we knew the steps. At 5 nights, this would be our longest trip yet, but it wasn’t going to be the highest mileage. The west end of the Freezout trail was closed for the season due to deadfall, which also meant that the Hudson pond lean-to site was inaccessible. We wouldn’t be able to complete the full loop, but that just meant we had an excuse to come back again. Five nights meant we’d need to carry more food than previous trips, but since we travel fairly light and dehydrate a lot of our own meals anyway, that wasn’t a huge challenge. The only piece that remained unclear was exactly where we would leave the car. We knew there would be a portion of road walking to make a complete loop, and our preference is generally always to get this out of the way at the beginning of the trip. However, despite a few phone calls we hadn’t clearly determined whether trailhead parking at the Wadleigh Brook trail was actually appropriate. Plan “B” was leaving the car at South Branch Pond campground which was only a few kilometers away, so we left that final decision until we arrived in the park. After looking at the potential parking spots on our way into the park and talking to the ranger, we went with plan B which made for a short day 1 and a long day 6. It was a beautiful sunny day as we set out from South Branch Pond campground. Unfortunately we were a little anxious as Wade had been under the weather for a few days. We were both thankful it would be a short day. The first (and only) legitimate take-off-your-shoes river crossing of our entire route greeted us right as we stepped out from the campground. In a definite foreshadowing of what was to come, flies found us instantly as we paused on the other side to put our shoes back on. We headed up over the South Branch Mountain trail. It was initially forested and though we had low expectations of the view from the north peak (the guidebook said they were “limited”) we found there really no views at all. Without the sign, we’d definitely have walked right on through. We kept going and the trail quickly began to open up. 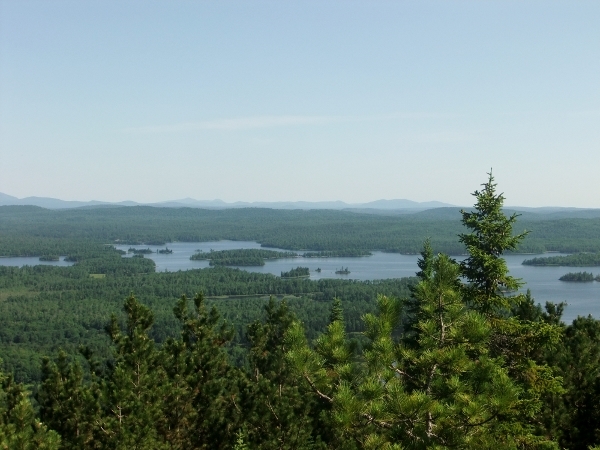 The views around the south peak are pretty spectacular – Katahdin to the south, the Traveler to the east… haze aside these are views worth enjoying! We spent a few minutes trying to identify all of the peaks and ranges that we could see. This is where we remembered that once again that we had forgotten to bring a full park map, rather than just the areas that we would be hiking. It’s always fun to be able to identify the features off in the distance. We’ve spent enough time in the park that we probably guessed pretty well, though we didn’t agree on everything. Hopefully we’ll remember the larger maps from now on! We didn’t linger for too long before starting the descent to the Upper South Branch Pond lean-to. The descent seemed to take longer than we expected. The lake falls out of view and then trail then wraps around quite a way southwest of the lean-to before gradually circling back. The lean-to is located in a forested area set just back from the shores of the pond. This would be a fun spot to canoe. There were some neat views from the water’s edge, though the most memorable part of the evening was unfortunately the flies. We were wearing our bug jackets with built-in hoods, but still barely wanted to open the zipper even enough to even get the fork in for quick bites. Summer in Maine! The day started slowly. From the lean-to it was only a few hundred feet to join the Pogy Notch trail back toward South Branch Pond campground. From there, we set out along Middle Fowler Pond trail. There were a few views early on as you passed between Little and Big Peaked mountains. We were undecided about how many detours we’d take, but there was no way we could pass by this sign. A quick 0.3 mile climb and we reached the summit. 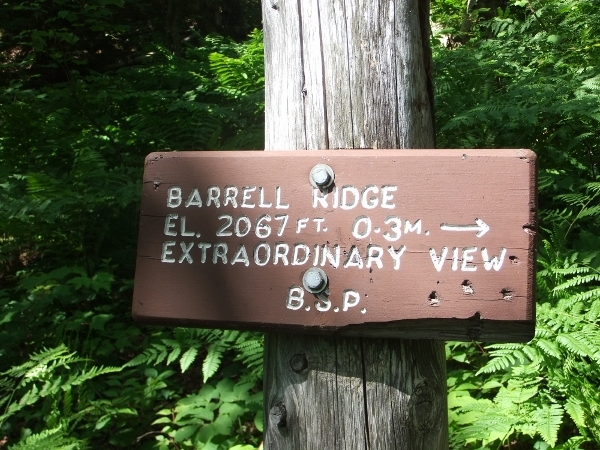 The views were grand, but hardly “extraordinary” by Baxter standards. We were joined on the summit by a group of researchers who were working to catalog some of the park flora. We stopped for just a quick break and then pushed on. The trails get more than a bit confusing as you enter into the Fowler Pond area. Much of this we had already discovered and thought we’d sorted out from reviewing multiple maps and trail descriptions in advance, but we were still a bit unsure of exactly where some of the trails stopped and started. Regardless, it was neat to reach the ponds and see yet again another side of the park. Below is our most amazing discovery of the day. We stopped at Middle Fowler North tent site for a relaxing lunch and swim. We decided an after-swim nap was in order, so we set up the tent and rigged up a temporary clothesline. We’ve always stayed in lean-tos in the park, but this definitely made us wonder if we’d been missing out on some great spots by not considering the tent sites. The water was clear and refreshing and we didn’t see or hear another person the whole time. After lunch the trails were mostly level and forested along Five Ponds trail, though increasingly slippery and muddy as we grew closer to Trout Brook Farm campground. We had seen Trout Brook Farm on a few occasions as we drove along the Park Tote road, but we hadn’t actually been in the campground. It covers quite a large area and we had chosen a walk in lean-to site at the far end. We had a long chat with the ranger about our plans for the next few days. He made sure we were aware of the Freezout trail closure. From the lean-to it was just a short walk to Trout Brook, but the water was high and flowing fast. Its high rocky shoreline wasn’t suitable for swimming, and we didn’t have the energy to go searching for a better location. It was easy enough to get water though. We made a quick supper and eventually found a tree for a bear hang (we’ve blogged before about the fact that Baxter doesn’t provide bear hangs other than at their two main backcountry campgrounds), and we were ready to get some sleep. There weren’t too many peaks along our route, so we had planned a backtrack of sorts to loop around Trout Brook Mountain before heading further north. It was a fairly easy loop with some nice viewpoints along the way, though the summit itself was a bit overgrown. We stopped back at Trout Brook Farm campground long enough to have the most fantastic (dehydrated) chicken and pepper jack cheese wraps for lunch, and then set out along the Freezeout trail. It wasn’t very heavily travelled and we were surprised that we needed to slow down and circle to find the trail markers a few times. A bit further along was evidence of a very busy beaver! We were travelling through land that had been logged in the early 1900s and the trail was on and off an old graded logging road. The guidebook mentioned that there was a large sawdust pile along the shore of Matagamon Lake. We weren’t sure what to expect, but it was definitely unmistakable once we arrived. We continued along past the sawdust, now back on the old woods road. We stopped for a quick cool-off at the junction of the Frost Pond trail and headed west. The trail was unpredictable, switching from a wide flat footpath to mud and overgrown shrubs and fallen trees. Luckily it wasn’t far to the lean-to. It was buried in tall trees, but just a few steps away from a private canoe on Frost Pond. This was where we first discovered the variability of “outhouse” in Baxter. We had seen quite a few different models, but until this point there was always a recognizable structure. This one was hard to find on what looked like an animal trail, and had no walls or roof. We paddled the entire pond, mostly watching the hundreds of thousands of dragonflies that were flitting around. It was quite magical. The pond was mostly shallow, and part of the exploration was to see if we could find clear running water at the inlet. No such luck though, so we just pre-filtered water from the deepest point we could find. Overall it was a lovely evening capped off by an amazing sunset. This was going to be our shortest day of the trip (perhaps our shortest hiking day ever) so we set a leisurely pace. Our first brief stop was to explore the Northwest Cove tent site. Given that it was right on Matagamon Lake, we were surprised to see that it hadn’t been used in quite some time. Even the fireplace was completely full of tall grass. The outhouse was in great shape, though. From there it was only a short walk to the Little East lean-to and campsite. We knew that this was a popular area, located right where Webster Brook flows into Matagamon Lake. There is a large new lean-to and new outhouse, along with lots of trees suitable for a bear hang. The large tent site is just a few hundred feet beyond the lean-to, and there would be no privacy if that site was occupied. There was no one at the campsite when we arrived though and it was starting to rain so we set up camp and decided to take a quick nap. It was just after lunch. We were awoken when a man came running into the site. I think we were equally surprised to see each other. He was with a canoe group that had pulled off just upstream to avoid some rapids, and was scouting out the best location to put back in. We didn’t see that group again, so they must have put back in just upstream and paddled quietly by. We relaxed for the afternoon and even had time for a quick swim. We heard a few other groups as the afternoon went on, though they all passed by in canoes. A few times we walked over to the shore to wave. For the second night in a row we were able to watch an amazing sunset, though on this night we were watching through the mesh of our bug jackets. We started out with a stop at Grand Pitch (Falls) along the Webster Stream. We had tried to find the falls the previous evening, but hadn’t walked quite far enough. We passed this collection of old logging tools and camp equipment, including part of an old wood stove. Shortly after we came across a very odd collection of items spread out over a few hundred meters along the trail. It appeared to be hastily scattered bits and pieces of gear. It was disconcerting to see a dry bag left wide open with a fairly new (through now completely saturated) sleeping bag inside, and a small pile of books that were destroyed, but clearly hadn’t been there for long. We were imagining all sorts of possible explanations, but none of them made any sense. We didn’t have any way to communicate what we had found, though we made sure to document the exact location. We later learned that a group of canoes had swamped the previous week. They were all fine, but had left some of their gear in the woods to retrieve at a later date. That was a much better story than some of the things we had imagined at the time! Shortly after we passed the site of the former Webster Stream lean-to (now removed), which is little more than an open space with some wooden debris. We knew that we had entered the Scientific Forest Management area, and were not far below the park’s north border, but it was still odd to hear the sounds of machinery in the distance. Next came our grand misadventure of the day. We knew that the Freezeout trail was closed shortly after this point due to a series of blowdowns, and that we would be following a temporary trail relocation down toward the Hudson Pond lean-to. We had brought along the map showing the closure and relocation, and had also discussed this with the ranger. Just when we were getting close to where we though the closure would be, we came across the flagging tape shown in the photo on the left below. There wasn’t a sign to indicate that the trail was closed beyond this point, but it was in approximately the right location and we had been passing more and more trees fallen over the trail. We followed the flagging tape though the woods in more or less a southerly direction until the tape ended on a logging road. After heading a few hundred meters along the road, it took a turn and we could see by looking the map that we had made a premature turn off the trail. There was plenty of grumbling as we retraced our steps back to the Freezeout trail and just a few hundred meters ahead we encountered another mass of flagging tape, this time accompanied by the “Trail Closed” sign. Sigh…. at least we knew we were on the right track, though it was still not easy to follow the trail. It passed through areas of dense trees and brush, and the majority of the strips of flagging tape were lying on the ground. We figured that it was biodegradable tape that hadn’t stood up to the heat of the summer. It was slow going with more than a few false starts, but we gathered the crumbly bits and pieces and retied them at eye level as best we could as we passed through. It wasn’t long until we joined the Wadleigh Brook trail just north of the Hudson Pond lean-to, and just a bit further along we reached the shores of Hudson Pond and then the lean-to. The lean-to was a few hundred meters directly above the lake, though it was overgrown so there was no real view. The lean-to itself was one of the older smaller ones, and despite being on a hill, was situated directly over a big mud pile. Though there were lots of tall trees, branches suitable for a bear hang were few and far between, evidenced by abandoned bits of rope and rocks hanging in places. We eventually found a spot, and remarked that we still hadn’t seen the outhouse. After a bit more looking we were even more determined to find it. Unfortunately it took a while as we were expecting a much taller structure, rather than a deteriorated wooden box with broken toilet seat lying on the ground nearby. Oh well… at least this was our last night. On the positive side, once we were settled the wind picked up enough that the bugs completely disappeared and we were able to play cards sitting outside the tent for the only time on this trip. There had been bugs of one sort or another each day up to this point. It had worked out that this was going to be our longest day, so we set out early. Unfortunately the bugs were also up early to greet us. This area had been hit with a lot of blow-downs and we passed a few short trail relocations, though it was a bit hard to tell whether these were temporary or permanent. We stopped for breakfast at the Blunder Bog picnic shelter, complete with 2 new outhouses. This was located at one of the areas where the trail crossed an active gravel logging road. The bugs were fierce, and we didn’t linger. There was no shortage of beavers in this area, either! Here’s Heather looking pretty happy at the last trail junction before reaching the Tote Road for the walk back to the car. Surprisingly happy, actually, given that we had to cover a fair distance on the road back to the South Branch campground. It was harder mentally, knowing that we came so close to deciding to leave the car at the trailhead. It wasn’t a bad walk though, and we even took a brief detour to view some of the interpretive panels along the “Management Mile” designed to highlight the features of the managed forest. The high was making it into our last big unexplored region of the park. There was also great swimming which is a huge morale booster on hot trips. Lows… BUGS BUGS BUGS! There was the day of the blackflies, the day of the mosquitoes, the day of the stripey things, the day of the noseeums… there was even the day of the something-that-looked-like-they-probably-sting insects. With this post, we are now caught up on our Baxter adventures. We’ve walked 50% of the park’s trails and have quite a few more trips in mind. Hopefully we’ll be back soon!